We had some special guests on our flight back to the main land. There were 3 Boxers who joined us in the cabin. Normally dogs that don’t fit in carriers that go under the seats have to fly in the cargo area. 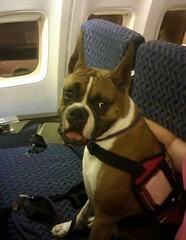 These Boxers were certified Guide Dogs so they were allowed to ride in the leg room area with their handlers. This particular photos was while we were waiting at the gate (they didn’t get the ride in the seats). I’m giving the owners of these dogs kudos! On our second day in Puerto Rico, we went on a snorkeling excursion. We went through Traveler based on other people’s recommendations. FYI, you have to call ahead to make reservations and the number is on the sign. We got fitted for goggles and fins at the dock and then took off for the ocean. On the way out our first snorkeling spot, we passed the El Conquistador Resort where my husband was a chef at one time. 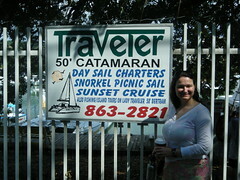 Our first stop was an island where several other excursions were anchored also. We got off the boat and there was a beach to hang out on and coral reefs off the shore. The water wasn’t very deep, but I think that I got some pretty good photos of the reefs. Once we had spent some time in the water, we got back on the boat for lunch and drinks. Everything was provided in the cost the excursion and they definitely did not want you going thirsty. Then we sailed out to anther location to anchor. We stopped just short of a private island. Supposedly the island was once owned by Ricky Martin. The water was much deeper, much colder, and much saltier. But the corals were a lot better with schools of fish everywhere. There was even an old lobster trap that was in the reefs that made for a good photo. We had a great day and the weather could not have been more beautiful. 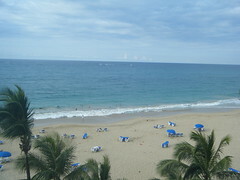 After months of planning, a friend of mine and I finally made it Puerto Rico!!! Our first day was filled with humidity, funerals, food, sight seeing, and more food. We took an early flight out of Tampa to arrive on the island at 10:00am. As soon as we walked out of the terminal, the humidity hit us like a ton of bricks. I am from TN and my friend is from FL, but it is already a lot hotter and more humid than the states. We weren’t in PR more than an hour when we got to witness a Puerto Rican gang member’s funeral. This is just speculation and can not be confirmed. We went to San Juan to eat lunch at a local favorite place-El Hamburger. The parking lot was only big enough for about 8 cars so they had someone directing traffic with parking spots while people enjoyed hamburgers, French fries, and a coke. After lunch we walked across the street to over look the ocean. Then we drove to Old San Juan. We went by the Fort El Morro. We did not do the guided tour, just got out and walked around. We went into The Catedral de San Juan where Marc Anthony & Dayanara Torres were married. We finally got checked into The San Juan Marriott Resort & Stellaris Casino. Our room was fabulous and the view was even better! We got a beach front room!!! We also went for drinks then we finished the night off eating some delicious food at Bimo’s. It was Dominican food and the dishes were huge! Show me your VW. Bug-A-Paluza is put on by Chattanooga Volks Folks. 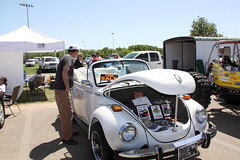 It is an annual event where VW owners can show off their bugs and where VW enthusiast can go and see some new VW and some fantastically restored VW. My favorite was this white convertible that had been restored. Unfortunately, they wanted $19k and that was way out of my budget! 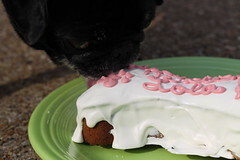 You are currently browsing the papaspugs.com Blog blog archives for April, 2010.